My husband, the incomparable yet curmudgeonly Cap’n Coupon and I have been together for fifteen years and married for over thirteen. We’re still getting to know each other. Half the things he says make me go “WHUCK are you even talking about?” But I think that may be why I still want to hang out with him. Because there are still a lot of surprises. Also, he's cute. 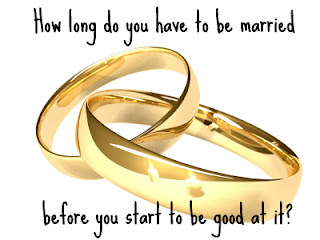 When we were courting and newlyweds (i.e., "the Schmoopy Period"), we were together all the time. We HAD to be together. When I would go a couple of hours without seeing the Cap’n, I would get lonely for him. If one of us got too busy with school or work or our friends, the other person would feel sort of hurt. I didn’t want to be alone, I just wanted to be with him. It was like a bad Carpenters' song. If he had given me a diamond necklace I couldn’t have loved him more at that moment. The truth is that, as we have both gotten older, we have discovered that we are like calories and fancy underthings. We need -- and can accommodate -- a lot less than we did years ago. And that's okay. But we still love each other, maybe more than before. It's just that we wish that we could give ourselves timeouts from time-to-time. Lydia: My uncle Joe is fully coco-loco. Can you believe he did that? Cap’n: Of course I can believe it, he’s been moon-bat crazy since before there were moon-bats. Lydia: What. Exactly. Do. You. Mean. By. That? Cap’n: Nothing. You look pretty today. Is that a unicorn out there on the deck? No such thing as little things. The Cap’n and I don’t really fight about big things. We either agree or compromise. Where to live, how many kids to breed, jobs, friends, family – all the important stuff we work out with surprisingly little difficulty. But the little things… Putting plates on the dishwasher instead of in the dishwasher, saying he’ll be home at 7 and then not leaving the office until 7 and forgetting to call me, not being able to find something and then glaring at me as if I have purloined whatever it is he’s looking for. 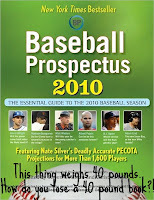 Like I have any use for the 2010 Baseball Prospectus. 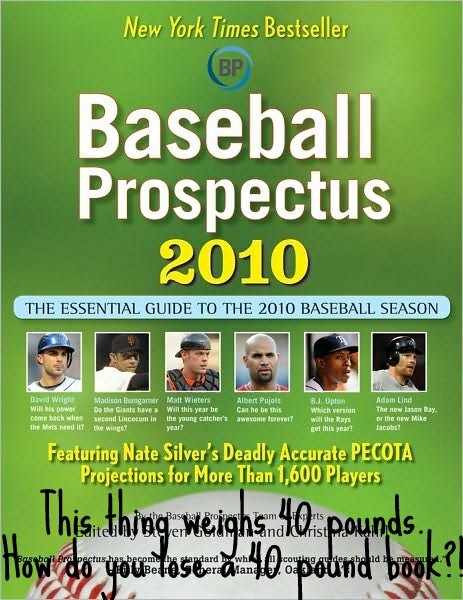 It’s a book of statistics the size of an encyclopedia. About baseball. What possible use would I have for that thing? These are issues that have driven me to freak the freak out on a fairly consistent basis for the past fifteen years, and there seems little hope of that changing in the future. The first year we were married, we owed about 4 times more money in student loans than we earned. We were broke-itty broke. It was The Year of Ramen Noodles. Over the years that ratio has flipped, but with every extra dollar we earn there seems to be about twenty more things we need to spend it on. About the same time we dug ourselves out of debt, three short people showed in up in quick succession. Let's be honest: they're cute and all, but they're expensive as hell. And I decided to try working and found out that after taxes and childcare, we actually made less money. 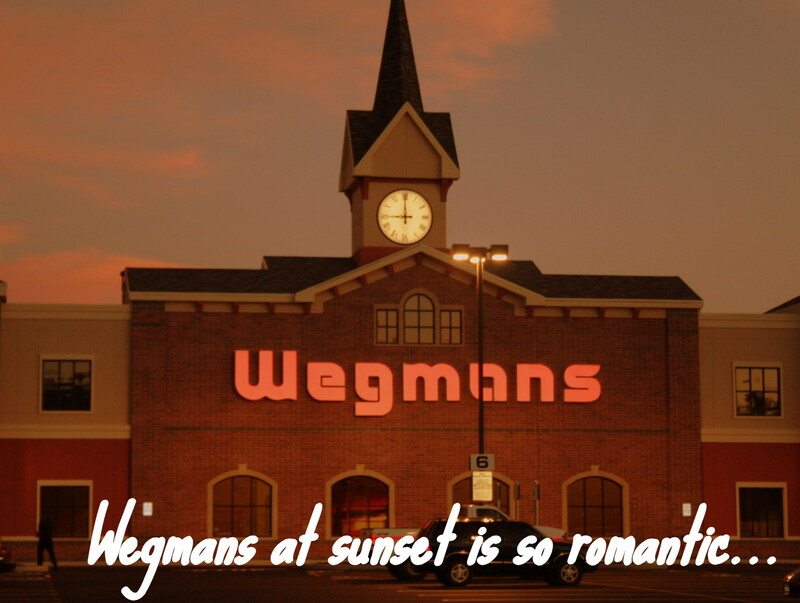 Romantic evenings usually include the grocery store. 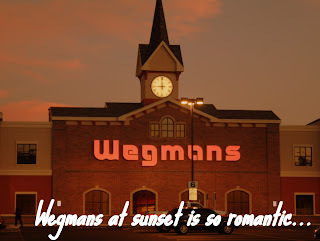 Do you have any idea the amount of planning it takes to schedule a romantic evening? First, you have to find a babysitter. Then you have to have the "Well, where do you want to go? I don't know. Where do you want to go?" conversation. 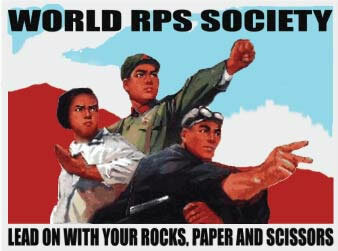 Then reservations must be made. Then you have to get gussied up. No wait. First, you have to gussy up your house because if your teenage babysitter had any idea how nasty it usually is she might not ever agree to sit on your couch and text work for you again. Then you go to dinner and probably eat too much and then on the way home you realize you're out of milk and Pull Ups. That's how every single hot date we have ends up at the grocery store.